how it works? - sketch me. CUSTOM PORTRAITS for facebook and twitter profiles. RETRATOS PERSONALIZADOS a mano. 1. Order by paypal or a credit card. 2. Send us by mail a high resolution picture to hisketchme@gmail.com. 3. Receive in a few days the sketch in your mail. After we receive the pay, and the picture in our mail, we work in your sketch to finish before a week. 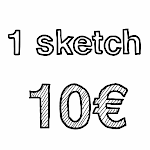 Normally we´ll send you the sketch in 2 or 3 days.